Can load .plist files from Particle Designer or Particle Designer 2. Has drawTiles renderer along with GL renderer. NOTE: work in progress, more features coming. 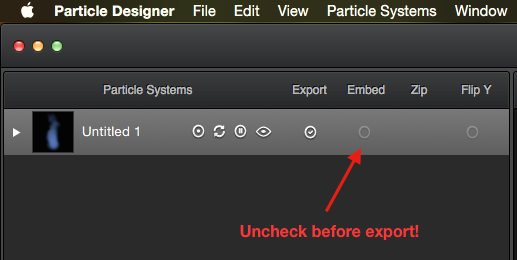 Embedded textures is not supported, so you must uncheck “embed” before export. However GL renderer is available only for html with -Ddom. html5 in canvas mode – still pretty fast, doesn’t support color effects. Can render incorrectly due to bug in openfl, please apply this patch if you encounter it. html5-canvas demo. native – fast, support color effects, hovewer in some cases GL renderer looks better. flash – slow, can be buggy (due to drawTiles implementation in openfl). flash demo. 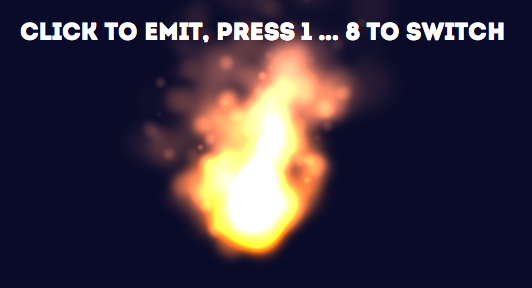 After transforming the code of my games from AS3 into Haxe/Openfl i was in dire need of a good particle system. Sadly Flint/Flinthx didn’t work anymore. But this seems like a very good alternative! Especially with the ParticleEditor made by onebyonedesign which exports plsits too.